Haebangchon (Hangul: 해방촌 Hanja: 解放村) (Haebang - meaning: freedom or liberation, and Chon - meaning: village) is a district of Yongsan-gu, in Seoul, South Korea. It is one of the oldest neighborhoods in central Seoul. It is also known as the neighborhood at the foot of Namsan (남산자락). The neighborhood's close proximity to Itaewon and the Yongsan Garrison US Army facility has made the area popular for expatriates and for military residents. In recent years, the area has become a haven for people from a variety of English speaking nations. The neighborhood is home to Korean residents, as well as Americans, Canadians, Filipinos, Australians, New Zealanders, Britons, Nigerians, Russians and Ecuadorians who have found their home in the "Freedom Village". Many businesses in HBC are foreign-owned and offer a distinct flavor not found elsewhere in Seoul. Recently, Haebangchon has become the 'new' area in Yongsan to open or establish a new business. It became one of the hot places in Seoul juxtaposed with Itaewon and Gyeonglidan-gil (right across the street from Haebangchon). On the old alleyways up to Namsan, cafes, restaurants, pubs, studios, and bakeries are taking up. It is known for its unique atmosphere of co-existence of past and present, Korean and foreign. The HBC Music festival has been a main component in drawing people and new business to the Haebangchon area. It was originally the place which the 20th division of Japanese military had used as a shooting field. In 1945, after the liberation, a government office of the U.S. army took over the place. However, its control didn't reach out to the area and it was taken over by refugees from the North and returning citizens(귀환동포). It was the first start of the shanty town(판자촌). It was known as the neighborhood for those who returned for liberation but lost their hometowns. 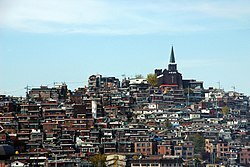 Heabangchon is a small village in Yongsan-gu, which is located in the center of Seoul, South Korea. It is approachable by public transportation. It is close to Noksapyung Station of Line 6 of Seoul Metro. On address, most of Yongsan-2-ga area and a part of Yongsan-1-ga are included. It is lying under the Namsan Mountain and of south of Namsan Tower. Haebangchon is one of the multi-cultural places in Seoul aligned with Itaewon and Gyeonglidan-gil. According to statistics 2013; 1,065 out of 12,648 residents of Yongsan-2-ga, are foreign . This can also be seen in and around the Sinheung-Ro area. Studios, art spaces, and food varieties from many nations line the main roads, and a few newer shops have gone into more residential smaller side streets. There is a convergence between residence and commercial space in HBC, however the buildings have always had the first floor as either parking or a business space for many years in HBC. Most recently (2018), Minerva Schools at KGI opened a campus in Haebangchon bringing with it around 200 international students to live in the area from September to December. There is a steep hill with 108 stairs. it is called 108 Heaven stairway (108 하늘계단). It was built during Japanese Colonial era to access the shrine easily. After independence from Japan, the shrine was demolished but the stairway remained. The stairway was used as a shooting place for Something Happened in Bali. The interaction is just as it was in the old days. There is Sinheung Market (신흥시장). About 25 years ago, the market used to be crowded; however, nowadays, there are only three or four stores left. "The premiere Independent music festival in Seoul, Korea. Hae Bang Chon (HBC) music festival has been running in the Yongsan Area since 2006. Started by Lance Reegan-Diehl and DEELEEBOB music along with James Gaynor. Musical attractions and people from all parts of Korea and the world, come to revel in the live music talents of independent music artists from all corners of the earth and all walks of life. The live music is made by professionals, up and coming artists, amateur acts, first timers, and old pro's at the local open mic. The HBC Fest converges two times per year in HaeBangChon the May Music Festival and the Fall Music Festival. ^ Lee, Sanghee, ed. "해방촌의 새 얼굴 (New Face of Haebangchon)." Photo. Hyejeong Hwang. Nylon Aug. 2014. Naver Magazine Cast. Naver, Aug. 2014. Web. 18 Oct. 2015. .
^ a b c d Shin, Soyoon. "해방촌, 또 하나의 코즈모폴리스." Hankyoreh21. Hankyoreh21, 18 July 2013. Web. 25 Oct. 2015. .
^ "과거, 현재 공존...해방촌 변화의 바람." KTV 국민방송. KTV, 2 July 2015. Web. 18 Oct. 2015. .
^ a b "서울의 과거이자 미래, 해방촌". 서울매력명소. Retrieved 2015-10-30. ^ "서울 Korea Times". Korea Times. Retrieved 2016-01-03. ^ "서울 HBC Festival Site". HBC Fest. Retrieved 2016-01-03. ^ "서울 Korea Guitar1". Korea Guitar 1. Retrieved 2016-01-03. ^ "서울 Korea Times 2017". Korea Times 2017. Retrieved 2017-05-25. This page was last edited on 5 February 2019, at 04:49 (UTC).